I had a wild morning in Boston a few days ago — participating in a satellite media tour for the launch of the Staples “stickK to it!” Business Challenge. (I sat in a studio and was serially plugged into about 20 local radio and TV shows … grueling, but efficient). The “Challenge” is a way to help small businesses and entrepreneurs reach their professional goals. Lots of people think of stickK.com exclusively as a tool for achieving personal health goals — like losing weight or quitting smoking. But this free program underscores that commitment contracts can be used on the job as well. People have already used stickK to commit to do all kinds of career-oriented tasks — write iPhone apps or call five new clients a week. Now it’s also easy to promise to use recycled paper or update your resume. What I love about the promotion is that Staples realizes that old-fashioned procrastination is a barrier keeping some of its customers from using some of its products. We sometimes put off upgrading our wireless network or reorganizing our files because other aspects of our day-to-day lives keep intruding. 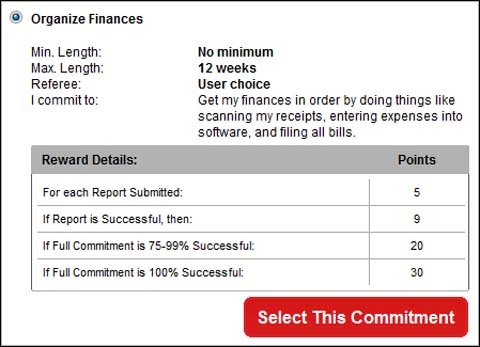 The challenge site has dozens of suggested commitments to jump-start the New Year. The "stickK-to-it! Business Challenge is a great business idea. People obviously respond well to incentives and in the economic position the US is in today the more incentive the better. This program could be just the push some people need to finally straighten up their finances or become better at budgeting their income. The idea is for the program is creative and in tune with what people need. But it is sad to think that a recession and desire to excel in the work place isn't incentive enough to motivate people to complete some of the tasks and goals that the program is geared towards. What does it say about the participants in this program if they need incentives like the ones in the program to motivated them to do better at work or other tasks or goals that already have their own incentives. And to throw this in here, it's too bad Staples and stickK.com didn't start the program before New Years. Think of all the career-oriented New Years resolutions they could have benefited from. « Previous PostFish Gotta Swim, Teachers Gotta Cheat? Next Post »The True Secret of Female MBA's?